Sergeant Eric Edmundson and his parents (Ed & Beth) arrived at High Adventure Ranch around Noon on August 30, 2011 greeted by Charles Puff (ranch owner), Monty Pitts (ranch manager), and Andy Wyas (ranch staff). Soon after their arrival, they enjoyed a hearty lunch that included Bison burgers as the main course…What else would you expect us to serve to get Eric pumped for his hunt? Ha! Ha! One thing that Ed stated over lunch is that Eric’s lifelong dream was to harvest an American Bison. Eric was so ready for his dream to come true, that he didn’t want to wait to hunt until the next morning…He wanted to hunt this afternoon. After getting the shooting gear setup on Eric’s 4x4 Razor ATV, Eric and Ed followed Monty in his 4x4 truck over many miles of rolling hills. They finally came upon a herd of Bison. With his binoculars, Monty looked over the herd to spot the best available Trophy Bison with a nice mane. He let Eric and Ed know which Bison he located. After a few minutes, the Bison was in the clear and broadside about 100 yards away. Eric made his shot and down went the Bison. Eric’s dream changed to reality! 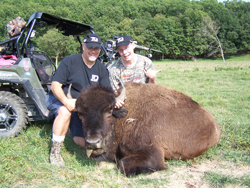 Beth came out later into the field to congratulate her son on his Trophy Bison harvest. Eric and his family spent another couple days relaxing at the ranch enjoying the sounds and sights of High Adventure Ranch. Eric is a true inspiration to all of us, showing us that nothing should keep you from your dreams and never give up!